A few weeks ago, The Paley Center for Media put on their annual PaleyFest — two weeks of nightly panels from some of your favorite TV shows past and present. Years past, the PaleyFest has included shows like Buffy The Vampire Slayer, LOST, and 90210. This year included a Freaks & Geeks/Undeclared Reunion (which I WISH I’d known about soon enough to go), Glee and The Walking Dead. The final panel of PaleyFest this year (and the one that I went to) was on Raising Hope. For those of you who may not have seen this freshman show, I highly recommend it. The basic premise is that Jimmy has a one night stand with a girl who turns out to be a serial killer. She gives birth to their baby in jail before she gets the death penalty and so Jimmy (and his white-trash parents & mawmaw) have to raise the (ADORABLE and hilarious) baby girl, Hope. That may sound a little…odd…but it’s an incredibly funny sitcom and has me laughing every, single week. Kate Micucci (who plays Sabrina’s cousin Shelly) was in the audience, so they made her stand up a couple of times too. The event started out by introducing Greg, and then he introduced the screening portion of the evening. They actually chose to screen the season finale for us, which was really exciting — though it means I can’t really talk about it, since I wouldn’t want to spoil anything! I can say that it was REALLY funny though, and brings back a lot of great recurring characters from the first season. It does a really good job (like a lot of their episodes do) of blending funny with genuinely touching moments — as Shannon mentioned during the panel, I think that this is a big reason that the show is as good as it is. The panel afterward was really interesting — a lot of it ended up being about the actor’s background and kind of an “actor’s studio” on how they create the characters they portray week after week, but there was also a lot of talk about the writing and shooting process; and they also touched on what it’s like to consistently work with an infant and how Hope growing up will effect later seasons of the show. 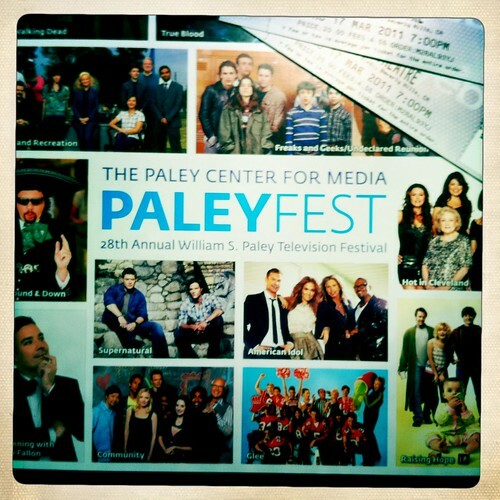 I’ll definitely be checking out the PaleyFest lineup next year!